Our ancestors navigated endless wilderness and vast expances of ocean without the slightest hint of a landmark, a compass, or (my god!) a GPS. The backbone of this ancient skill and the center of all direction is the North Star, which marks the northern axis of the earth and can serve as the starting point for finding your way when wandering, lost, or wanting. This world is in constant transition as day gives way to night, birth to old age, and winter snow to spring rain, but the North Star, Polaris, has remained an unwavering flag in the sky for ages past and will remain so for ages to come. The easiest way to locate it is by using the familiar constellation the Big Dipper, which I’m going to change to the Big Bow and Arrow in order to explain the method to you. It’s a little more fool proof that way. 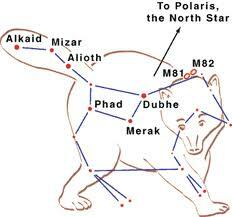 I’ve also written two myths that will help you remember and explain the way to find Polaris in a storyteller way. But before we go into that, let’s learn to love the stars. 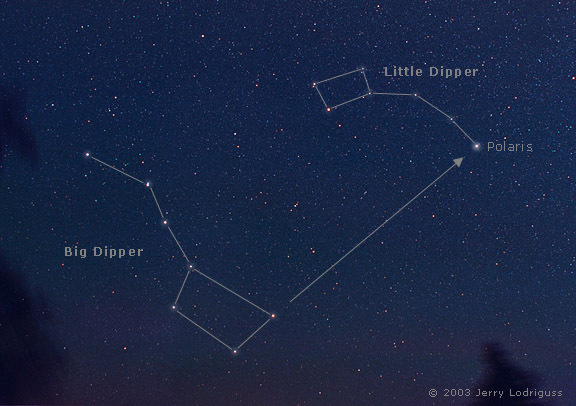 What is the Big Dipper? 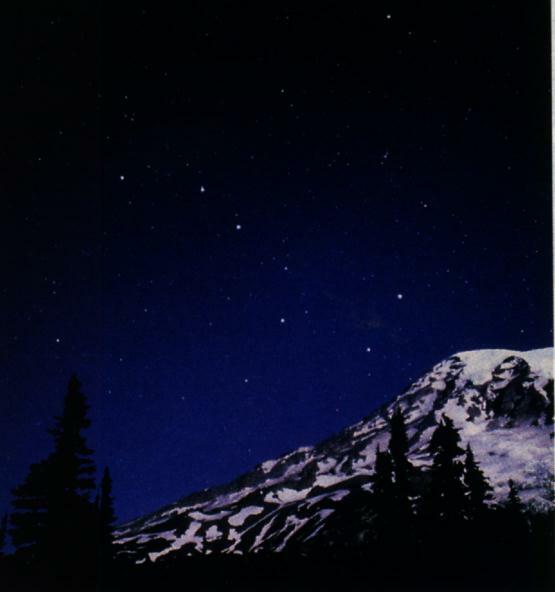 The Big Dipper, perhaps next to Orion, is the most recognizable constellation in our sky. It’s commonly visible above the horizon, most especially in April. Known classically as Ursa Major, The Great Bear, the mythology behind this constellation has been called “the oldest story in the world.” People all around the earth have upheld the tradition of the Great Bear for maybe 20,000 years, conventional scholars giving it a birthplace in Asia where it spread West across Eurasia and East into the North American continent. Whether through common ancestory or the collective unconscious, the Great Bear has been prowling the heavens, a symbol of strength and endurance for many generations. It is often imagined as the hunter who chases all the other constellation-animals through the night sky. 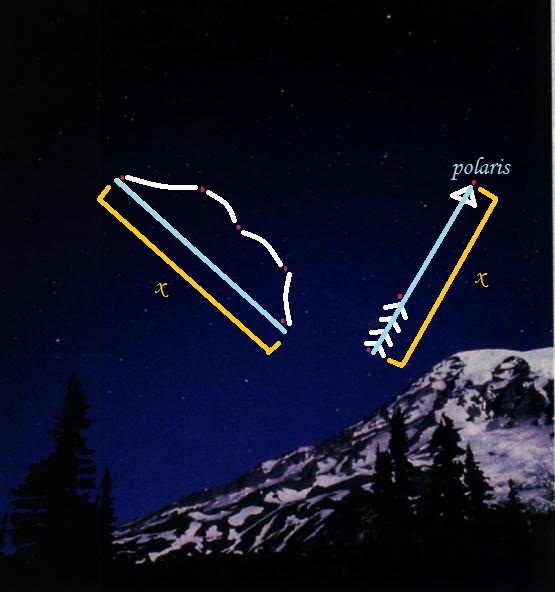 Polaris, known also as the north star, the pole star, or simply the tip of the handle of the little dipper, is the star which rests just almost on the northern point of the earth’s axis. Thus, it’s the only star in the northern hemisphere’s sky which appears not to move. Polaris is steeped in ancient lore and has been fondly used by humanity for thousands of years to find true north when lost at sea or in the wilderness. While our planet rotates, causing the sun and stars to move from east to west, this star alone stays (relatively) still. Latitude can be roughly calculated by the position of Polaris. At the equator, it lies directly on the horizon. At the north pole, it is directly overhead. Symbolically, the Pole Star represents the pinnacle of the Axis Mundi, the World Axis, whose microcosm in the indivisual is the kundalini, the crown chakra corresponding to this “still point” (the empty hub of the wheel of karma) around which all creation, thought, and desire dance in restless cycles. The Axis Mundi is also mirrored in the Tree of Life which bridges the Underworld in its roots (the realm of ghosts and demons), the Middle World at its trunk (where we live), and the Heavenly World in its branches, leaves and fruits (realm of gods, ancestors, and ascended spirits). The Pole Star has a special place in various Native American medicine wheels as well, representing the North, white, winter, death, rebirth, the spirit world, or any number of other important things, give or take depending on the tribe. Look to any people, and they have legends regarding the importance of Polaris as a beacon of peace and eternal steadfastness in our unrelentingly volitle universe. A forlorn Shoshone tale (which I’ll use since I’m in their land right now) says that the North Star is a mountain goat who was the greatest climber on earth. One day he was trying to reach a high, spearlike peak when he found a cave that lead to the top. Struggling up the passage he kicked rocks that blocked his way back down and found that once he got to the top, he was utterly stranded by deadly drops on all sides and hardly any room to run around. His Father, the Creator, had compassion for his favorite son. Although he was stuck on the high, frosted peak forever, his Father mandated that all the spirits in the sky would circle around this brave mountain goat to honor his memory. The shine of Polaris is a silver ring in his ear. The easiest way I’ve developed to explain how to find little Polaris using these stars is to transform the Big Dipper into the Big Bow and Arrow. The Bow consists of the five stars that make up the Dipper’s handle and the side of the ladel closest to the handle. Picture a string on this imaginary bow. The length of the bow string is the same as the length of the arrow. Impose the length of the bow string onto the remaining two stars, the bottom of the Arrow (where the feather or “fletching” is) at the base of the opposite corner of the Dipper, running through its top corner star and on into the night sky. The tip of the arrow will point to Polaris, the North Star. Polaris appears virtually stationary, as if it’s the center of the wheel of the stars. This is true north. To your right is east, roughly where the sun will rise, to your left is west, where it will set, and to your back is south, where there are penguins somewhere. Now, remember it like this: Out hunting for mushrooms one day, a woman named Fexah found an egg in the roots of a pine tree. She took it home, where she lived with her grandmother and son, and put it in a nest of hay, folded in the blankets on her bed. One early morning, well before the sun came up, the egg woke Fexah with a little crack. She watched as it slowly hatched and twin serpents came out, each one as white as the moon. They became good companions and never struck anyone, but kept the family’s home clean of spiders and flies, and eventually mice. They grew to be as big as a man, and the grandmother, whose name was Menorah, considered them very sacred. On their days out hunting, Oloh and Payla would catch ground squirrels and rabbits while Dasho went after antelope and deer with his bow. They never came home emptyhanded and everyone they knew had plenty to eat. One day, they were far out in the hills following tracks when a cougar pounced on Dasho. He hurled it off of him like lightning and drew his knife. Oloh and Payla struck at its legs, but before Dasho could attack the cougar threw them off with its claws and dashed off into the woods. Oloh and Payla laid wounded on the ground, and Dasho let out a sorrowful yell like a falling tree. He laid down with them and wept as their movements became weak, but before they died they spoke to him. “Don’t be affraid, we will help you even in the next world,” they said, and at that both stretched out. “Cut us open and you will find gifts we left for you,” they said, and passed into the world of the spirit. Dasho did as they said. Inside Oloh he found a bow string, and inside Payla he found an arrow. Both were the same size, the size of the snake twins, and neither ever broke. Dasho went on to feed all his people for years using these magical weapons. And although he had many bows break over the years, the string and arrow lasted until he died an old and honored man. When he finally passed on, he left his bow and arrow in the stars so that the arrow would always point north, and he could guide his people forever. Now you know a little bit about orienting yourself by the stars. Next I’ll go into navigating by the sun and moon, and how their positions change by the seasons. Finally I’ll go into the Zodiac and other constellations to navigate by. Saihung looked deeply into himself. He was completely immersed in that which was inner. Inner became eerything. Inside and outside became one. Plunging deep within, he came to the perfect realization. Inner and outer became one in infinity. He was a focus. A pinpoint of the cosmos. A place where infinity had congealed into one mass of movement and experience… He was a microcosm of eternity. Saihung imagined the Big Dipper Constellation. Silence. Space. Everything was real. Nothing was real. Both were equal. Time and space doubled back on each other in serpentine layers and lost heir distinction. What went beyond duality? Humanity was a microcosm of the universe. They were one. One was everything. The organs were the planets. The psycic centers were novas. The meridian points were stars. The meridians were pathways to heaven. The Big Dipper came to him. He called it. He willed it. He entered it, and it lifted him past the highest clouds, through the sleek canopy of the azure sky into blackness. All was dark save the scatter of stars. The universe was night, but day exploded and burned in its folds. He hung there floating. It was soundless. He had projected the stars into himself and now he himself projected like a star. A meteor. A sun. This entry was tagged bear, big dipper, myth, navigation, north star, polaris, pole star, primitive skills, star lore, ursa major. Bookmark the permalink.